2.1 Beat Senseless... By a Girl, no Less! Convince Braith to stop bullying Lars. Talk to Lars Battle-Born and agree to help him. Talk to Braith and get her to stop bullying Lars. 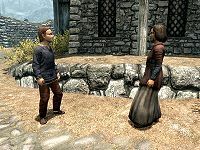 Wander around Whiterun and you may hear Lars Battle-Born being picked on by Braith. Speak to Lars and he'll explain that he's being bullied. He'll also offer you his life savings to deal with the problem: "Yes. Braith bullies me all the time. All the elders think I'm a milk drinker 'cause I can't fight. Nobody understands. If you can get Braith to leave me alone, I'll be your best friend... forever! I'll pay you, too! My whole life's savings - two septims!" Beat Senseless... By a Girl, no Less! Bergritte: "Lars, dear, why don't you go outside and play? It's a beautiful day." Lars: "That's all right, grandmother. I like staying home with you." Bergritte: "It's that Braith girl again, isn't it? Has she been bothering you again? I've a mind to speak with her mother." Lars: "No! Please, grandmother, don't do that. I'm fine. Really. Can we just... not talk about this anymore?" 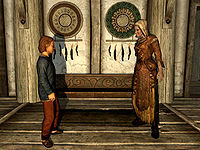 Lars' no-nonsense mother, Alfhild Battle-Born, will take a much harder tone, saying: "My boy Lars has been getting beat senseless, and by a girl, no less!" Lars "Braith. I.... I've come to tell you that I'm not afraid of you anymore." Braith "Don't make me laugh, baby Battle-Born. You'll be afraid of me till the day I kill you." "Battle-Born! Give me your money!" "Oh look, it's little baby Battle-Born." Lars "You... You're wrong! You can't hurt me anymore..."
"I... I don't have any money." Braith "Oh no? So you're gonna fight back if I punch you? Huh? You're gonna hit a girl?" 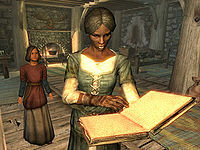 "You'd better give me five septims, right now, or I'm going to bloody your nose..."
"What are you gonna do if I don't? Huh? Gonna cry to your papa?" Lars "Well, no... I... I mean..."
"No! Please! I really don't have any money, Braith! I'll give you ten septims tomorrow. Just don't hit me." Braith "That's what I thought. Now get out of my way, baby. I got things to do." "Ten septims tomorrow, baby Battle-Born. Or I'm gonna bloody your nose and your lip." "I'm Lars' bodyguard. Mess with him and you mess with me!" "He has a disease. It's very contagious." "You want to be shipped off to the Honorhall Orphanage?" Amren: "Listen, Braith... Why don't you talk to your mother about this, okay? There's a good girl." After the quest conclusion, you'll notice that Braith no longer bullies Lars, and in fact keeps her distance from him. Lars will thank you for your help, and Braith will tell you that she has stopped bullying him. You can only speak with Lars Battle-Born between 8am and 8pm. After completing this quest, even if she continues with her same abrasive dialogue, Braith becomes friendly to you and will occasionally give you a gift or invite you to play. You do not have to complete this quest to receive your reward (2 gold pieces). After completing this quest, you can freely enter and take low-value items from the Battle-Born house. This can be useful for the Missing In Action quest. On the PC, it is possible to use the console to advance through the quest by entering setstage FreeformWhiterunQuest01 stage, where stage is the number of the stage you wish to complete. It is not possible to un-complete (i.e. go back) quest stages, but it is possible to clear all stages of the quest using resetquest FreeformWhiterunQuest01. This page was last modified on 10 July 2015, at 14:00.